As I sit and try to write this post my mind is preoccupied with the devastation in Uttarakhand. This does not seem like a good time to share recipes but it helps to drift and introspect a little bit. With huge death toll, thousands of people still stuck at many parts and huge number of dead bodies spread across the area the valley is now shivering in the fear of an huge epidemic outbreak. Far away from the worrisome area in the safety of our own homes all we can do is to pray for the safe recovery of all who are stuck there and salute our soldiers for the awesome work they are putting day in and day out. Amidst all these natural destruction my home front is not very happy too. With so much pending work in the new house and such bad health many a times am losing my temper. And like many other times to settle things down my way I resort to cooking. Not that am able to do much but still once in a while stirring the pot makes me happy. 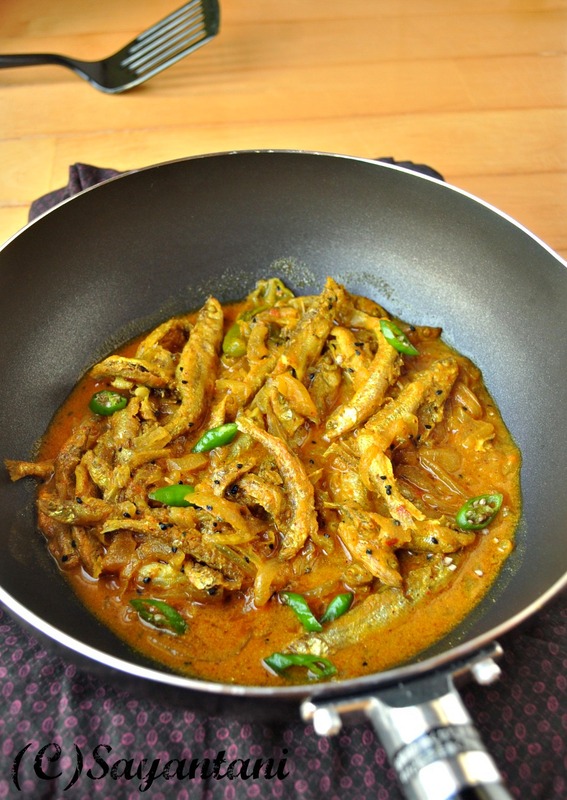 This Mourola macher jhal or Indian Anchovies in a spicy mustard-y gravy is one such dish. Its utterly simple but gives a rare kind of satisfaction to the taste buds. These small fishes have a very distinct taste which pairs really well with mustard paste. Wen laced with green chilies and sliced onion and cooked in a spicy jhalmach, it never fails to elevate all the senses. Unlike any other fish cleaning and preparing mourola is comparatively easy. All you need to do is make a small slit in its belly and gently press with your thumb to take out all the innards. If you are one like my mother you probably wont even need to make a slit, Press-squeeze-clean is all she needs to do. While watching her favourite daily soaps on Star Jalsa she can clean a few kgs of this fish. I have cooked this dish with fresh anchovies in Japan and it was all the same. Many a times I add julienne potatoes (thickly cut) to cook along with fish and it tastes really delicious. It’s a joy for me to watch even my son to enjoy such pure Bengali delicacies now a days. Clean and wash the Mourola fishes under running water. Drain all the water and then mix it with 1/2 tsp turmeric and salt. Mix well and keep aside for min. 15 minutes. Peel and cut the onion in little thick half moon shape, slit the green chilies and keep aside. Heat the oil till smoking in a heavy bottom karai or pan. I generally use my non stick pan for this. Carefully place the fishes in one layer and fry on medium flame till golden brown on both sides. If you find it difficult to flip then let it cook for some more time, once its done it will automatically leave the side of the pan. Repeat the process if needed and fry all the fishes. Take out and keep aside. Now temper the same oil (if needed add 1 tbsp more and heat it through) with nigella seeds and slit green chilies. Once they start to splutter add the sliced onions and a pinch of salt. Sauté it on low flame till they start to change colour (3-4 minutes). Mix in the mustard paste and turmeric with ¼ cup water and add to the pan. Mix and let it come to a simmer. Cook for 2 minutes before adding 3/4 cup of water, chili powder and salt as per taste. Let it come to a boil on medium flame and then add the fried mourola. Mix and cover. Cook till the gravy thickens and the fishes are tender and juicy (approx. 7-8 minutes). Add more green chillies and few more drops of mustard oil if desired. Serve ho with warm rice. You can also add potatoes in this dish. for that peel and cut the potatoes in lengthwise in ¼” thickness. Once you fry the fish fry the potato pieces with a pinch of salt and keep aside. 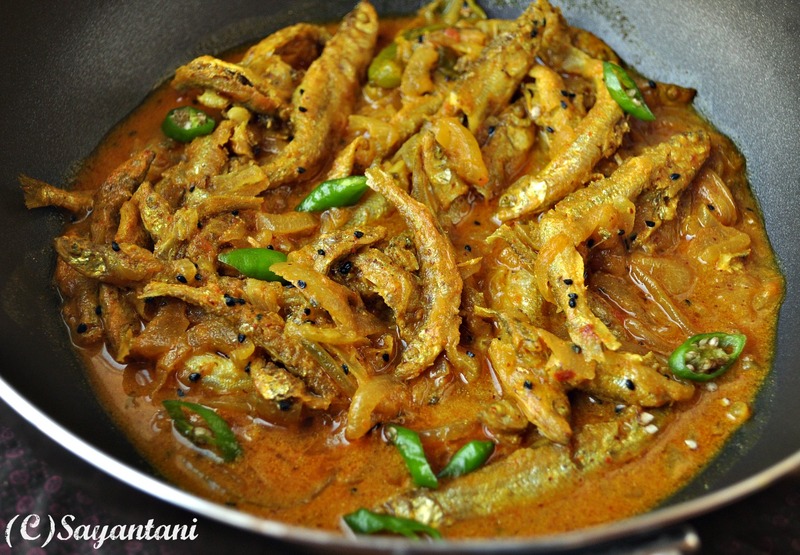 Add them to the mustard gravy along with the fried fishes and cook till soft and buttery. mourola mach, mola mach, anchovy, anchovy curry, fried anchovy recipe, anchovies in mustard, indian anchovies recipes, how to cook anchovy in Indian way, spicy anchovy in gravy, Macher jhal recipe, sorse mach recipe, sorshe macch recipes, bengali macher jhal recipe, sorshe die mola mach, sorshe peyanj mach. 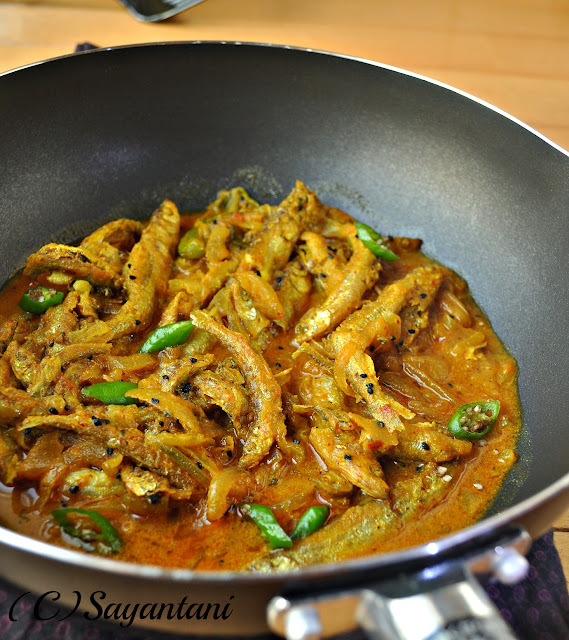 bangali mourola recipe, mourola begun die, morola charchari. One of my favorite, made it few days back. Yours look so inviting. Inviting food,wish i live near you.Never cooked anchovy like this. I will try it with sardines.